In conjunction with the 25th anniversary of Raw Vision, international Japanese fashion house Comme des Garçons is working closely with the magazine throughout the year. Raw Vision is allowing Comme des Garçons to use images and layouts from all its past magazines as the basis for its worldwide communication purposes for the whole of 2014. Between 20 and 30 communication leaflets in the form of mini booklets will be made and sent to interested parties around the world. Every year, Comme des Garçons works with an artist or creative group, whereby they give Rei Kawakubo permission to use existing work which she renders completely new again, through graphic creations and sometimes additions of other work. Halle Saint Pierre celebrates 25 years of Raw Vision, being the first magazine published with the sole purpose of bringing outsider art to a wider audience. Featuring classical works of Art Brut, new discoveries, photos of extraordinary visionary environments and over 80 artists including Nek Chand, Joe Coleman, Sam Doyle, Howard Finster, Adolf Wölfli, Alex Grey, Tom Duncan, Michel Nedjar, Norbert Kox and many others. Special bumper 25th anniversary issue out now! The Art Brut artist's extraordinary gun sculptures and weaponry. The African-American self-taught artist's intricate graphic universe. The visionary anatomy of the striking Czech artist. Late paintings by the English painter of celestial visions. An introduction to the powerful portraits of the Liberian artist. 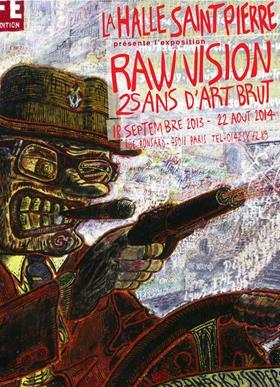 A new museum devoted to Art Brut opens in Portugal. Gaudi of the East Side's mosaics on 70 light poles in NYC. Getting to know self-taught artists Theo and Hans Krüsi. Don't miss out! 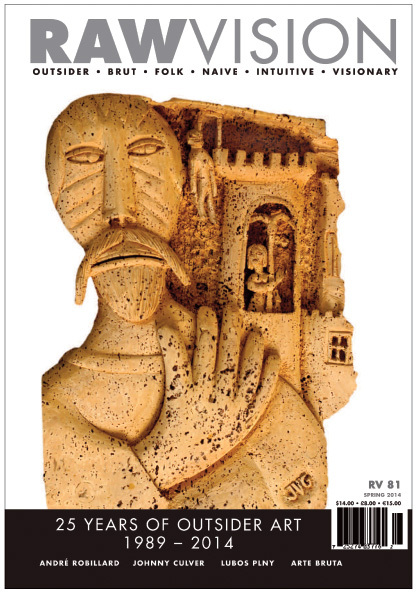 Click here to order your copy of this special issue, or click here to subscribe.